This entry was posted on March 29, 2018 by Jessica Anderson. 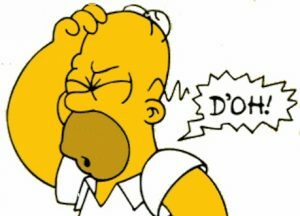 Don't be Homer...learn from other's mistakes so your award presentation is perfect! Misspellings. Don’t ruin your gorgeous engraved award with a simple misspelling. - Read the text backwards – bottom to top – you won’t have context for the words, so it’s easier to find mistakes. - Double and triple check the spelling of the name. Spelling the person’s name correctly is EXTREMELY important for obvious reasons. Broken awards. Many customers don’t open their shipping box until the day of the event and to their surprise, find awards damaged during shipping. Because our items are fragile, be sure to open the box and check your awards as soon as they arrive. In case of breakage, contact us immediately so we can send a replacement. Trophy doesn’t match the accomplishment. Be mindful of what you are celebrating and have the price and stature of the award match the achievement. Too much text. Many of our awards have a very limited space for etching. Too much text on this small space creates tiny letters that are impossible to read. If you have a lot of text, choose a wall plaque or other award with adequate space for your message. Not presenting it. The worst is not presenting the award to your honoree; just handing it to them in a box loses the impact of the accomplishment. For more tips, read my blog post How to Present an Award. Be smart - learn from past customer’s mistakes and make your award count!